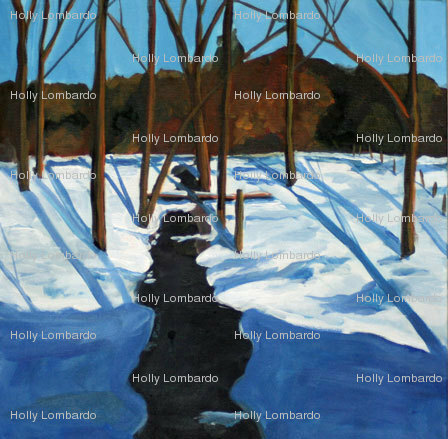 Holly Lombardo is a self-taught American painter and photographer who works in watercolors and acrylics, creating landscapes, still life and suburban scenes. She publishes her artwork on her blog, Painted Paper by Holly, and her photos on another blog, Photo Paper by Holly. Her photographs are interesting not only for themselves: many exhibit compositional features that may be traced in the artist’s paintings as well. 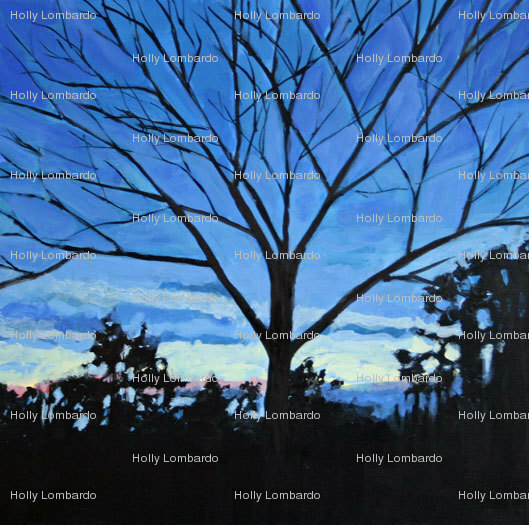 In today’s review I would like to discuss Holly Lombardo’s landscapes with trees (images have been watermarked according to the artist’s request. 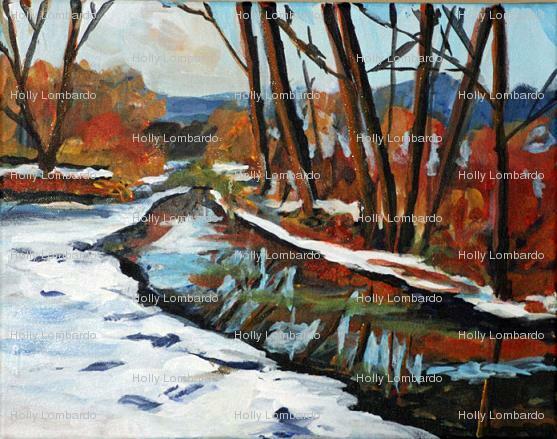 Visit Holly Lombardo’s website to see the original reproductions). There is something folkloric about these trunks and branches. They are impressionistic stylizations of trees that can be comic and admirable at the same time; they resemble clumsy trolls who look menacing at first only to reveal their soft nature later. I have had the privilege of reviewing several paintings of trees, for instance by Robin Neudorfer or Casey Klahn, but I don’t think any of them so readily invited such a warm, homey association — despite the lack of foliage, the snow and the cool blue. To me it seems as though the trolls just went out to have some fun and soon would return into their lairs to drink mead and tell stories. There is a compositional rigor to it all: the paintings carefully balance chaos with calm by clear-cut borders. First, sharp angles between various tree parts generate a sense of urgency and aggression while the woods seem to move and expand, as the general upward direction indicates. Second, all these movements and threats are either pruned by the frame or carefully contained by the trees themselves: the branches aim at the local center of the piece (where the trees concentrate) or above, where they collide and in a way neutralize each other. Finally, bordering trunks (or lowest branches) enwrap the entire display and isolate it from the rest of the piece, proving how harmless the show really is. Thus the paintings are divided into compositional segments, more violent ones including criss crossing lines and sharp edged triangles and the quiet ones consisting of wavy patches of snow or curved lines contouring a forest or a river bank. It is interesting that snow, after melting, turns into water which in turn would feed the trees and put on a coat of leaves on them. Trees with foliage — trolls appeased with mead — are no longer menacing. A scene in the painting above, where the river water divides (or in fact connects) between the woods visually foreshadows this paradigm. Eventually, the trolls get their mead — and we get our story. Elijah, Thank you VERY much for a thoughtful and interpretive review. I find it revealing that you picked up on my LOVE of trees- it’s my most common element, and I appreciate that you noticed that I do try to balance vertical with horizontal, sharp with soft. Regards! You’re welcome — it is my pleasure. Of course there were other things that I was tempted to include in this review, like the light and the colors, but I decided to really focus on the trees and probe into how they influence the viewers.